Preheat the oven to 170°C/gas mark 3. Butter and flour a 20cm springform cake tin. Put the chocolate in a bowl over a pan of freshly boiled water. Leave to melt, then allow to cool slightly. Meanwhile, cream the butter with the sugar until pale and fluffy. Fold in the melted chocolate, then the flour, vanilla extract, the egg yolks and the ground hazelnuts. Whip the egg whites until stiff. Stir a third into the chocolate mix. Fold in the rest. Spoon into the tin. Bake for 20 minutes. Reduce the oven to 150°C/gas mark 2. Bake for 25 minutes more. Remove and allow to rest for a few minutes. Remove from the cake tin. Cool on a wire rack, then wrap in foil. Make the ganache: melt the chocolate as above. Bring the cream to a boil in a small pan then stir into the chocolate. Beat until glossy. Cool slightly. 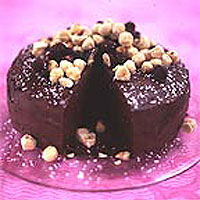 Cut the cake in half, fill with ganache, then cover with the remainder. Leave to set, then serve.